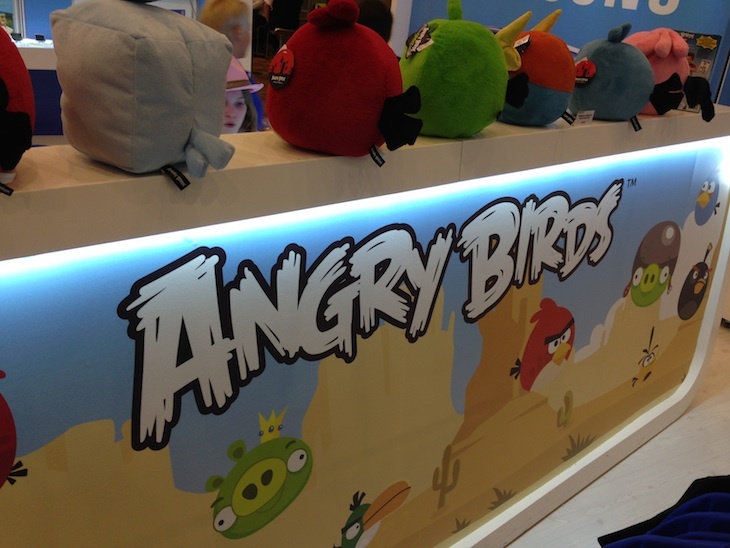 After 3 Years Of Angry Birds, What's Next For Rovio? 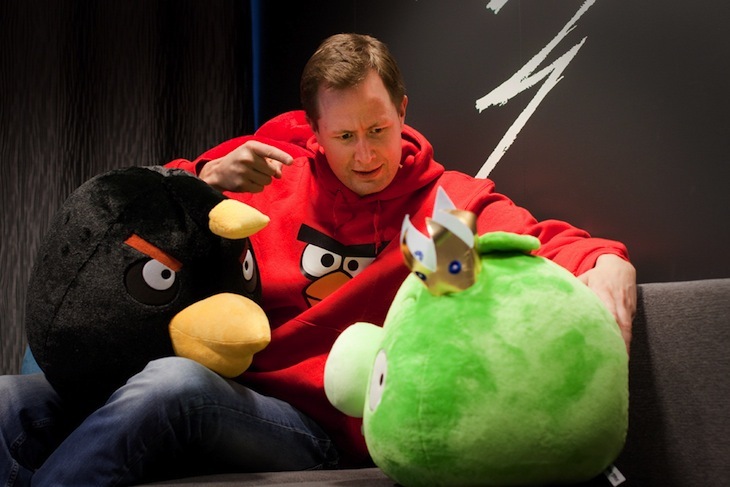 Inside the nest: After 3 years of Angry Birds, what’s next for Rovio? Darkest Fear. CyberBlood. Dragon & Jade. Wolf Moon. Those are the names of only a handful of the more than 50 games that were developed by a small Finnish upstart called Relude between 2003 and 2009. There’s a pretty good chance you’ve never heard of – or don’t remember ever playing – any of the dozens of games the studio has made since its inception, but you’ve likely heard of the one that radically changed the game for its three founders – and the entire mobile gaming industry to boot: Angry Birds. First launched for Apple’s iOS platform a little over three years ago, Angry Birds is a relatively simple, casual but incredibly addictive puzzle game, featuring comical and recognizable characters. It allows players to utilize a slingshot to launch feetless, flightless birds at green, egg-stealing pigs stationed on or within various wooden, glass or metal structures, with the intent of destroying all the pigs on the playing field. As players advance through various of stages, new types of birds with special abilities become available. This is the backstory of how the game catapulted Rovio to worldwide fame and fortune, shook up the Finnish startup ecosystem, and how the cute, cheap mobile game will become the catalyst behind – inevitably – one of the biggest technology-related stock offerings in the near future. Whether an IPO happens in 2013 or not, it will be interesting to see if Rovio succeeds in its mission to turn Angry Birds into a global brand that can stand the test of time, and if it will manage to attain prosperity beyond the successful Angry Birds franchise. Last week, I sat down with Rovio CEO Mikael Hed, the older cousin of co-founder Niklas Hed, gaming industry veteran and Remedy Entertainment co-founder Petri Järvilehto (EVP of Games) as well as Ville Heijari (SVP of Brand Marketing) at Rovio HQ in Espoo, Finland, to learn more about the history of the company, and where it is heading next. You couldn’t have predicted the success of Angry Birds when Relude, later and rather tellingly renamed Rovio Mobile and, subsequently, Rovio Entertainment, was founded nearly a decade ago by a trio of friends who had met at the Helsinki University of Technology (now Aalto University School of Science): Niklas Hed, Jarno Väkeväinen, and Kim Dikert. Hed, Väkeväinen and Dikert started Relude in 2003 after emerging victoriously from a relatively small mobile game development competition sponsored by Hewlett-Packard and Nokia. Coincidentally, the contest was partly organized by an HP executive by the name of Peter Vesterbacka, who would, years later, join Rovio as CMO and ‘Mighty Eagle’ and become known as the public face of the company around the world. But first, we go back nearly a decade, when the company was still a fledgling upstart. Mikael Hed, who had been studying and working in France and the United States, came back to Finland after 8 years abroad and looked for business opportunities. Although Rovio, then still called Relude, was co-founded by his cousin Niklas, it’s not like joining that company was the most obvious move for Mikael to make. “When I returned to Finland, I looked at different employment opportunities and I think joining Relude was the one that offered the most uncertainty, but also the most fun,” the affable CEO tells me. “It was one of the most intriguing options for me at the time. Me and my cousin had always been close and even as kids, when we got together, we would play games. Later, we would talk about what kind of games we would make if we could, but we never really thought we would actually end up doing it to be honest. “But then Niklas did start a gaming company, and I thought, you know, why don’t I help these guys out a bit and set it up as a proper business while I look for other opportunities,” Mikael recalls. He made the jump in the spring of 2004, arranged the first office space for Relude and started thinking about how they could possibly make money with this whole gaming thing. The company sold the rights to its first game, Mole War, to another Finnish game development company called Sumea (now part of Digital Chocolate). Mikael revealed during our conversation that Rovio Entertainment actually bought back the Mole War rights from them this year, ‘mostly for sentimental reasons’. “When we started out, the industry was completely different, with Finnish gaming companies like Sumea and Remedy Entertainment dominating in their respective fields. They were way out of our league,” Hed recalls. At the time, a lot of eyes in the mobile gaming industry were also fixed squarely on Nokia, which was due to release its ill-fated N-Gage gaming device and platform in October that year. 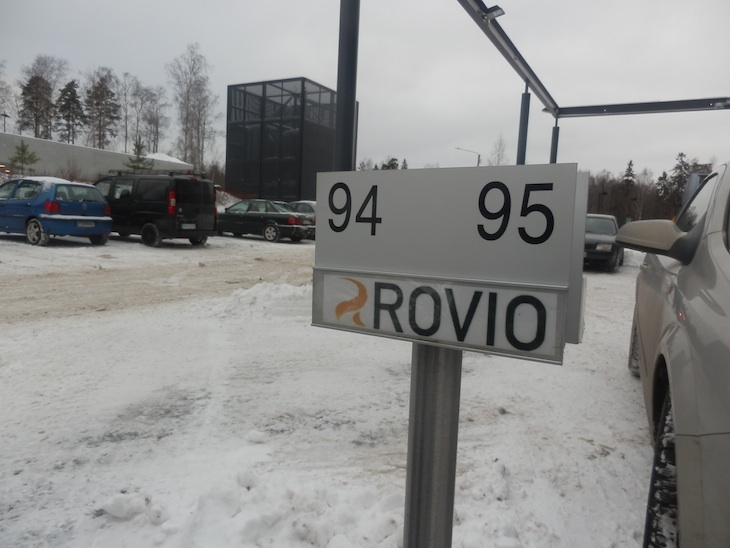 Nokia, whose Espoo HQ is coincidentally just a 10-minute stroll away from Rovio’s current headquarters, had been commissioning small studios worldwide to develop games for cellphones and the upcoming N-Gage device. Relude was just one of many, as it tried to figure out how to make money from making games for the small screen. “The first year, we were just learning about the whole business and trying to figure out how you can make any kind of money at all from making mobile games. It was very different from what it is like now. It was very, very tough,” Mikael explains. The small studio made a bunch of games in the years after its founding, none of which were runaway hits. Of course, when you look at the mobile gaming landscape back in the mid-2000s, it’s easy to understand why pretty much all small- to medium-sized game developers were having trouble creating these ‘hits’ in the first place. “The mobile operators were very much in control in those days, and only 1 or 2 people at the carriers were in charge of what content would end up getting in front of their customers. It was hard for any developer to even get on their radar if you hadn’t already made 10 good games, and showed that they were 10 other games still in the works,” Mikael says. Relude also had to deal with the problem of fragmentation – not a new phenomenon indeed – and build games that were compatible with hundreds, later even thousands of handsets. Centralized mobile app stores and discovery engines weren’t around either, so mass distribution was almost unattainable for any mobile game developer. “It required huge costs to make games and be able to get them to customers. You needed a traveling sales crew that would meet all the operators in the world, and employ staff that would literally do nothing but port and test games so they would work with multiple platforms and handsets,” Mikael says. Although it kept producing its own games, the small gaming studio gradually fell into a work-for-hire routine. Due to a dispute with his father, Kaj Hed, who is the chairman and majority shareholder of Rovio, Mikael left Rovio in mid-2005, only to return in early 2009 when the company was flirting with bankruptcy. But not before exploring some entrepreneurial activities of his own. Mikael turned his attention to an entirely different form of content, comics, because, he posits, it was way cheaper than building games. It turned out to be a terrible business, however. After comics came real estate, another one of his passions, but the global financial crisis put a damper on that venture as well by the end of 2008. While Mikael was waiting for the real estate market to stabilize, he was asked by his cousin and father to take a look at some of the – mostly financial – challenges Rovio was facing in the meantime. Mikael re-joined Rovio, first as a consultant, and tried to come up with a new strategy for the company, which had gone from 50 to 12 employees during the time the businessman had been dabbling with other ventures. 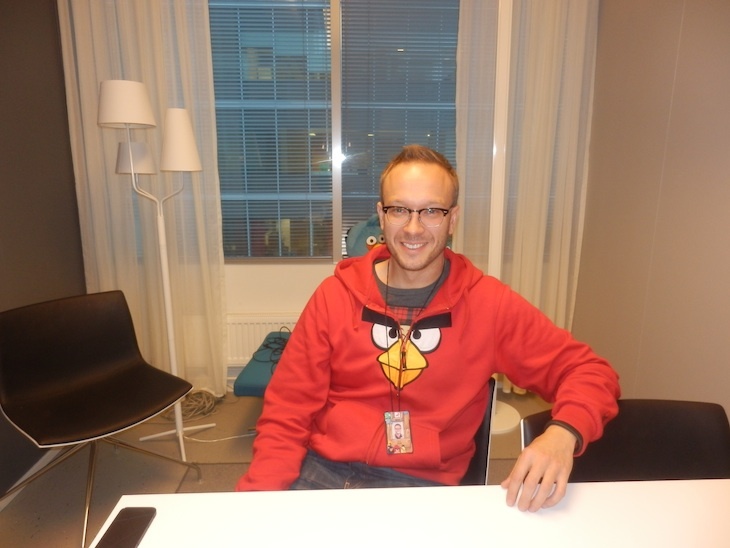 “We looked at new strategies for the company, which was then still relying a lot on subcontracting work, because we wanted a convincing story to tell investors who could potentially finance Rovio,” Mikael recalls. Rovio changed its production processes so it could take on one more work-for-hire project, using a subcontractor of its own, and at least have ‘half a team’ working on its own games again. From the outset, Hed wanted to do things properly this time around, leading him to make a pivotal decision that would later prove to be visionary. “We had a whole new set of criteria of what kind of games we wanted to do next. A new aspect, something we hadn’t thought about before, was how do we create IP that could be used elsewhere, and not just in games,” Mikael says. Based on what he saw happening in the market, Mikael and the rest of Rovio’s management team methodically planned for their next game to be designed and built for smartphones first, but to be quickly expanded to other platforms and devices, including gaming consoles, after that. Then it would create a pipeline where the IP that was created could be used to score licensing deals with manufacturers of physical goods and merchandise, a pipeline and distribution channel that could also be reused for future games. It was a very calculated approach, and the plan was sound. Now all Rovio needed was that hit game. Fortunately for them, one of its senior game designers, Jaakko Iisalo, had a creative breakthrough. For some time, Iisalo had been developing the idea for a two-dimensional physics-based games for Apple’s iPhone, which had taken much of the world by storm at that point, silently in the back of his mind. While his employer was making ends meet with work-for-hire, the Hed-devised strategy called for the creation of a hit game, and the future of the company could hinge on the success or failure of that new title. Iisalo had proposed a number of game ideas to Rovio’s management, but all were shot down almost immediately. One of his ideas featured initial artwork for the now well-known bird characters, however, and they became loved by many inside the company. By later combining the birds characters with the physics-based puzzle game he had been thinking about, Iisalo planted the seeds of what would eventually become Angry Birds. The early versions of the game didn’t have a slingshot or pigs, nor did they show the flight path of the birds after they were catapulted – all those things were added much later. But everyone at Rovio fell in love with the simple gameplay and the humorous characters, and focus quickly shifted to making it the best game they could produce. To this day, Iisalo is still very much involved with the development of new games and levels for the Angry Birds series – his official title is Creative Director. With a combined 1 billion downloads across a wide variety of supported mobile and desktop platforms – including both regular and special editions such as Angry Birds Seasons and Angry Birds Space – the game has proven to be an incredible, global success story. Notably, it took only half a year to go from 500 million to 1 billion cumulative downloads for Angry Birds. That number was released back in May 2012, by the way, so it’s likely a hell of a lot more by now. The company declined to share an updated number with me, but did share that mobile downloads of Rovio games grew 172 percent for Q1-Q3 of 2012 compared to the same period in 2011. The company later followed up with a spin-off game called Bad Piggies, which has also become a hit, and Amazing Alex, which was less of a success (more on that later). Not that Angry Birds was an instant hit, though: it took quite a few months before it got real traction. It’s worth noting that, today, the game is not only a popular waste of time on mobile devices. For instance, AppData pegs the number of daily players of the Angry Birds Friends game for Facebook at roughly 1.7 million – although the number of monthly active users appears to be trending downwards in recent times – while its Facebook page has received no less than 22.7 million ‘likes’. For your information: that’s more than Britney Spears, Snoop Dogg, Ke$ha, Michael Jordan, AC/DC and even pizza. 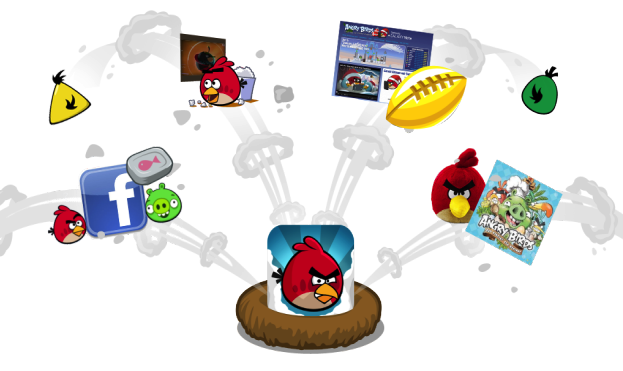 Earlier this week, Rovio released its second game on Facebook, Angry Birds Star Wars. It’s a force to be reckoned with in the social gaming space now, too, in addition to the mobile gaming industry. But there’s a reason the company isn’t called Rovio Games, but Rovio Entertainment. The Angry Birds franchise has given wings to Rovio Entertainment, which the company was renamed to in July 2011. In May 2012, the company released its financials for the full year of 2011, the second year after the launch of the first Angry Birds game. Rovio Entertainment revealed that it had booked revenue of 75.4 million euros ($106,3 million) and earned 48 million euros ($67.6 million), before tax, in calender year 2011. That same year, it had closed its first big investment round, raising $42 million in funding from Atomico and Felicis Ventures – started by Skype co-founder Niklas Zennström and longtime Google executive Aydin Senkut, respectively – and Accel Partners. Asked about Rovio’s financials for this year, Järvilehto would only tell me, with a smile on his face, that they are “very strong” and that it’s been a “good year”. Again, this is after a lot of rough years. Pressed about the potential of a 2013 IPO, Mikael says successful companies always have multiple options, and that Rovio management simply hasn’t decided what to do yet. Mainly to accelerate the recruitment of experienced game developers and designers, the company has in the past made two strategic and talent acquisitions: first Kombo Animation Studio in the summer of 2011 and then Futuremark Games Studio, the gaming arm of benchmarking software developer Futuremark. 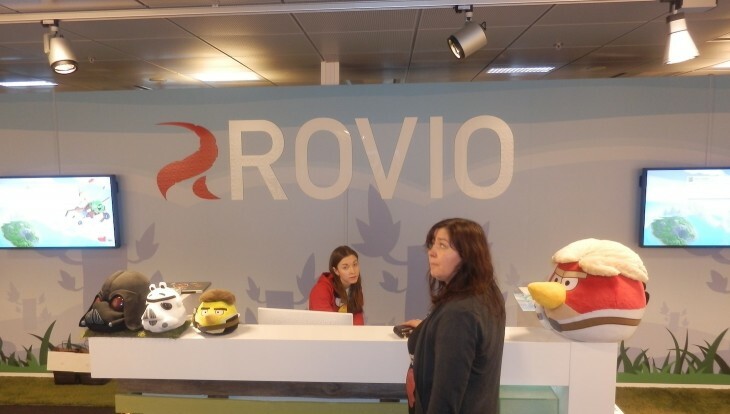 Rovio Entertainment currently employs over 500 professionals in its headquarters in Espoo and offices in Tampere (Finland), Stockholm (Sweden), Shanghai (China) and Santa Monica, California (United States). I’ve heard whispers about the upcoming opening of another development studio in Barcelona, Spain, but none of the executives I spoke to would confirm this. One thing is for sure, though: the company continues to hire like crazy. Notably, many of Rovio’s employees are working on something that has nothing to do with the actual development or distribution of digital games. With now well over 400 licensees worldwide, Rovio collects cash from the worldwide sales of Angry Birds-themed plush toys, apparel for men, women and kids, stationery, cookbooks, headphones, towels, lunch boxes, keychains, iPad sleeves and cases, baseball caps and even golf balls. To illustrate: on the day following Thanksgiving Day in the United States, also known as Black Friday (November 23), Angry Birds had 8 out of 100 best-selling toys and games on Amazon. At the moment, 6 of the 20 best-selling plush toys are Angry Birds-themed. Today, roughly 50 percent of Rovio’s total revenue in 2012 will come from selling consumer products, and the company intends to expand into other areas such as education and learning solutions, activity parks, ebook apps and more throughout 2013. For the record: revenue from merchandising and whatnot was only 30 percent of total sales last year, so that part of Rovio’s business is growing at a rapid clip as well. 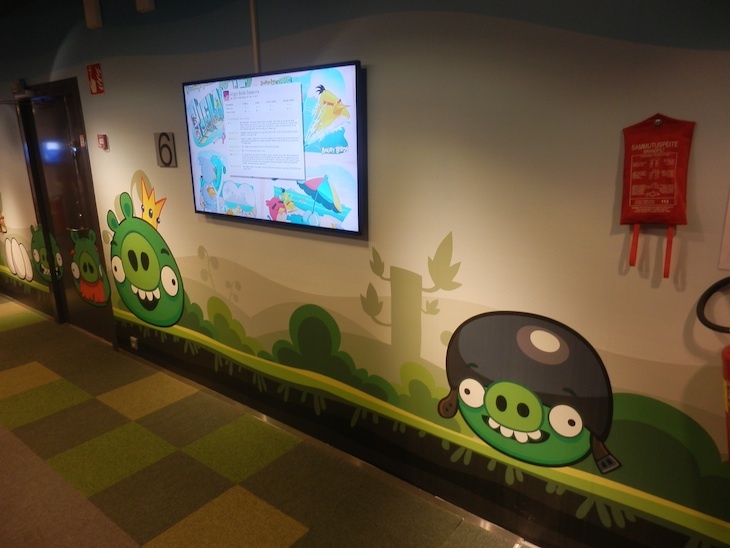 To give you an idea of its ambitious plans for the future: Rovio CMO and ‘Mighty Eagle’ Peter Vesterbacka told me earlier this year that the company wants to plant 100 Angry Birds-themed activity parks, big and small, by the end of next year – in China alone. Released in March 2011, Angry Birds Rio was Rovio’s third game in the Angry Birds series. The game was released as a marketing tie-in with the 20th Century Fox animated feature film Rio, and was promoted alongside the movie. The movie created some confusion among fans, many of whom believe to this day that Rio was a Rovio-produced Angry Birds feature film. Such a film is currently in the works and slated for release in the summer of 2016. After exploring deals with major Hollywood studios, Rovio Entertainment decided to self-finance the movie. “We found ourselves in the lucky position of being able to afford producing a movie,” Mikael explains. “We had the opportunity to work with a number of Hollywood studios on this as well, and I have to say that it wasn’t easy to say no to them. “That said, we’re trying to set up a structure that will allow us to produce it for a smaller budget than most major Hollywood studio would reserve, but still be able to compete head-to-head against them in terms of quality,” Mikael says. To go from idea to a commercially viable end product that stays true to Rovio’s creative ideals, the company has recently hired John Cohen for the production of the movie. Cohen previously produced the animated movie Despicable Me and worked closely with Blue Sky Studios on films including Ice Age, Robots, Ice Age: The Meltdown and Dr. Seuss’ Horton Hears a Who. David Maisel, former Chairman of Marvel Studios and executive producer of Iron Man, serves as executive producer for the Angry Birds movie. Mikael tells me the film is in the early stages of production already. Of course, if it will indeed hit movie theaters in the summer of 2016, that means we’ll have to wait longer for it than the 3 years the Angry Birds game has been available so far. That makes it a gutsy move. I asked Mikael if he was confident that Angry Birds will still be relevant enough a couple of years from now for the movie to become a hit. He responded with a question. “Angry Birds is popular and top-of-mind worldwide right now. In four years time, there will be plenty of people that will still know it. If Angry Birds would completely fall off the face of the earth today, we’d still have like a billion people out there who will recognize it in a few years. The upcoming film isn’t Rovio’s only connection to the magical world of movies. 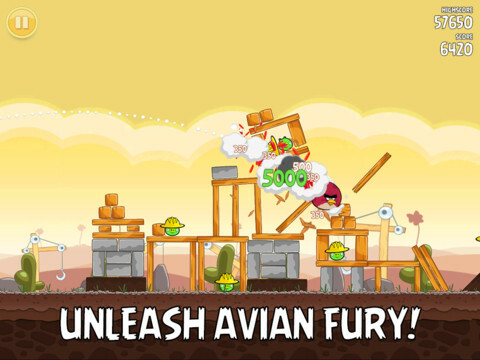 In November 2012, the company released the latest version of its Angry Birds game in partnership with Lucasfilm. Dubbed Angry Birds Star Wars, the new game from launched across a wide variety of platforms – including iOS, Android, Amazon Kindle Fire, Mac, PC, Windows Phone and Windows 8 – at once, and quickly turned out to be another smash hit. Concurrently with the game’s launch, Rovio and Lucasfilm released a slew of tie-in merchandising products and a cinematic trailer, which retells the classic Star Wars cantina scene with Angry Birds characters in the starring roles. Compared to the massive success of Angry Birds, Rovio’s Amazing Alex game, released back in July 2012, hasn’t been quite as big a hit, despite a promising launch. The company won’t break out the number of cumulative downloads of the physics puzzle game, which it did for Angry Birds, but it’s ranked relatively low in most countries according to AppAnnie. Järvilehto and Mikael Hed don’t consider the game to be a failure, however. “Any other company would probably be very happy with the success of Amazing Alex,” Mikael says. Be that as it may, many are wondering if Rovio can keep milking the Angry Birds franchise for a long time to come, and how big the pressure is to produce a next worldwide hit the size of it. 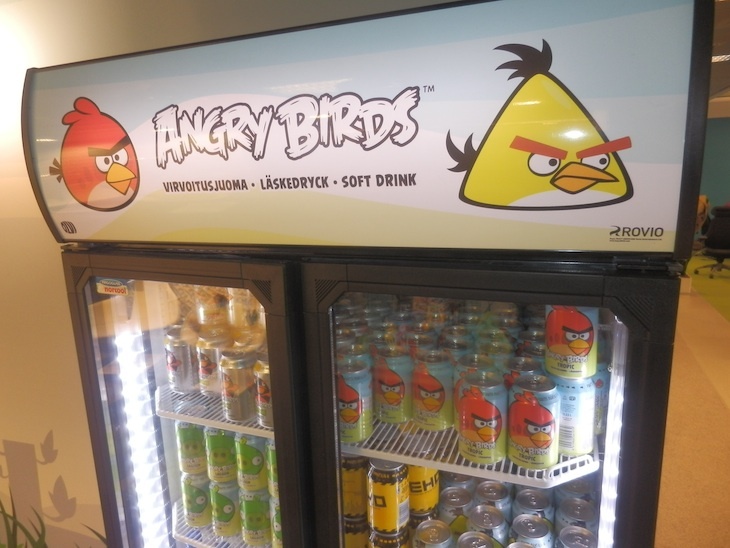 Aside from its huge fan base on Facebook and Twitter, its retail stores and many licensing partners, Rovio’s biggest marketing channel is actually its own games, I learn from Ville Heijari, the company’s SVP of Brand Marketing. “It’s humbling to have the kind of audience we do, for, essentially, one brand. All these people from every corner of the world that are following us on Facebook or elsewhere, it’s almost a bizarre experience,” Heijari says. Heijari is particularly proud of the animations work Rovio has done for Angry Birds, and enthusiastically showed me some of the YouTube videos from the company’s topical playlist. He also casually points out the size of Rovio’s overall YouTube audience: the company’s channel has over 320,000 subscribers at present, and has clocked nearly 900 million views in total to date. When Ad Age recently published its ‘Top Viral Ad Campaigns of 2012’, Rovio’s Angry Birds Space: NASA announcement video ranked third, ahead of video campaigns from giant brands or companies like Samsung, Procter & Gamble, Intel and M&M’s. Commenting on the fact that Rovio’s licensing division has apparently almost grown to the size of the gaming business, Heijari says he expects both to grow significantly. Likely, he adds, they will also eventually be complemented by another strong leg, the animations and film business, in the future. I asked Heijari whether he thinks people will eventually get tired of Angry Birds, given the heaps of licensing deals Rovio has closed since the game came out, and the sheer amount of merchandising that’s already available – we’re talking thousands of physical objects already, after all. Asked what the biggest challenge is for Rovio in the years to come, Heijari asserts that maintaining the current momentum is challenging enough at the moment. “You’ve created something like Angry Birds. So how do you subsequently create something the size of Angry Birds again? Will the next game we make be equally big? I say potentially yes, but I would argue that it isn’t necessarily crucial to Rovio keeping things going”, Heijari says. “We just need to focus on continuing to build the Angry Birds brand. The next thing we do can be as big, but it can also be smaller, it can be regional, it can be a different audience. “Talking about creativity, by the way, I’m particularly offended when people claim we’re simply doing the same game over and over again, when they clearly don’t realize how much effort we put in the details, and how different the various Angry Birds versions are from one another. Those aren’t traits that are typically associated with Finnish people or companies in a country where modesty is the norm. Asked what’s so special about working for Rovio, Heijari tells me that he’s never worked for any company where the employees take so much pride in their work.